This is standardized testing week, and my students usually appreciate having the week off. All students should plan to participate in this formal recital featuring “dance” music. Invite your family and friends! An event for students levels 2 and up who would like to be adjudicated by a professional educator. Cheryl Green has been a mentor to me, and currently teaches in Spokane, WA. This is an excellent opportunity for students to perform their recital pieces, or other prepared pieces, for her feedback. Rates will be $17.50 for 20 minutes. Please let me know if you would like to be included in this event. I will be offering summer lessons June-August. Closer to spring, I will be handing out a calendar with select dates that I will be available. I will not be teaching September 2012, since I will be on maternity leave. I hope to begin lessons in October, and organize our annual Christmas event. I will be advertising at the IDEA curriculum fair, a popular event for home educators, since I am losing several wonderful military families this year. The quoted rate is higher than I am charging currently. (I am charging less than the going rate for my education level.) However, students who took lessons from me 2011-2012 will remain at the same rate 2012-2013. I have the most wonderful group of students, and I want to reward each of you for your special attention to Isaiah. We BOTH appreciate it very much! We have had a wonderful start to the new school year of lessons! Thank you to my students for making this year of teaching a pleasure! I want to let you know about some upcoming events. Please mark your calendars. I will not be teaching between these dates. Please have a wonderful Christmas! December 16th – 3:00-4:00 p.m.
All students are asked to participate in a Christmas program for the residents of the Denali Center. (The Denali Center is the “old folks’ center” attached to the hospital. ) Beginning in late October/Early November students will begin learning a Christmas song for the occasion. This is a casual performance opportunity, and also a chance for students to bless the residents of the center. Please make plans to attend. Please have your student dress “festive”. Parents, please set aside $5.00-$10.00 with November’s payment to cover the cost of a Christmas book for your student(s). Just a winter reminder: If the weather is 45 below or colder, I will notify you whether I am teaching or not. I would like 2 new students next semester. If you have friends who would be interested, please let them know about my studio. Thank you! Hope you all have a wonderful winter season, and I look forward to working with each of you toward a more musical future! We have had a wonderful start to the new school year of lessons! Thank you to my 25+ students for making this year of teaching a pleasure! I want to let you know about some upcoming events. Please mark your calendars. I will not be teaching between these dates. Thank you for understanding my need for a break. I will call each of you in January to let you know when I will be teaching again. December 6th – 3:30-4:30 p.m.
All students are asked to participate in a Christmas program for the residents of the Denali Center. ( The Denali Center is the “old folks’ center” attached to the hospital. ) Beginning in late October/Early November students will begin learning a Christmas song for the occasion. This is a casual performance opportunity, and also a chance for students to bless the residents of the center. Please make plans to attend. If you cannot make it by 3:30 but can come at 4, please let me know. Thank you! If you would like your student to earn a trophy this year, please let me know, and check the box on your application. 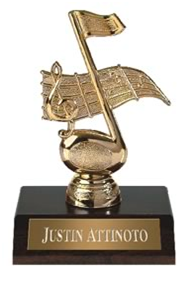 Trophies are $10.00 and include an engraved name. Please include the $10.00 with Augusts’ payment. To earn the trophies, I will assign students challenges such as: flashcards in one minute; superior counting for 20 weeks; etc…..
7.2 mi. Turn right at Green Acres Dr. Thanks to all my students for a very rewarding year! Kimberly Anderson and Vanessa Anderson won gold medals in the annual Music Festival competition. Olivia Gaskins received a gold medal for her original composition at the same event. Also, Kandice Hamilton won a silver medal for her composition. Seven students participated in the Adjudication Event, and twenty-nine students performed in our annual piano recital! Also, Daniel Alteneder played a wonderful solo piece for his senior graduation. Not to mention all of you who have been playing music for church, weddings etc. I am so proud of you! The news on my end is that I’ll be taking December and January off this year. I am having a baby at Christmastime. Because of this change in my life, I will be taking no more than 20 students this year. If you would like piano lessons next year, you need to e-mail me at: harmony.studio.ak@gmail.com to confirm that you would like a spot. Otherwise, I will fill my schedule with other students. Even if you have spoken to me about piano lessons, I still need you to contact me via e-mail to let me know that having Dec/Jan off, and any other possible delays, will not thwart your interest in piano lessons. Thank you very much for being understanding. I still plan to offer lessons 5 days a week. If you would like to request a date/time, you can also do so via e-mail. I can not guarantee that I can comply, but I can try. School schedule will begin August 16th. Please make plans to attend lessons that week. Students who are in level three or above will be strongly advised to have 45 minute lessons. These rates are competitively based on my B.A. degree in Piano Performance and my recent certification through the Music Teachers’ National Association. Please visit my web-site harmony-studio.net to check on current events. On March 5, 2010 I received my MTNA, Music Teacher’s National Association, certification. This was a two year endeavor that required a great deal of academic work and professional development. To learn more about my recent certification please read the following article.